There big names of chess in one picture: Carlsen, Topalov and Anand. | Photo: Shamkir Chess. Magnus Carlsen, Sergey Karjakin and Ding Liren won their games in round two of the Gashimov Memorial in Shamkir, Azerbaijan. Those three now lead after two rounds. Today was the round when the two world champions in the field played. Anand and Carlsen once again faced each other; they had filled each square of the chessboard with an earlier classical game. Including their two matches, the two played their 65th battle on Monday and it was the current world champion who improved his score against the previous world champion to 12-8, with 45 draws. It would be easy to state that Carlsen won in "vintage Carlsen style," squeezing something out of (almost) nothing. And it must be said that 27.a5! was one of those annoying little Carlsen moves that might not give an advantage objectively, but does invite the opponent to go wrong. 27.a5! still posed some problems in what seemed to be a totally equal position. However, Anand is probably is blaming himself for the mistakes he made in an endgame that was very drawish. At the press conference, at his request he was allowed to speak first and then leave. Carlsen described Anand's errors as a "lapse of concentration" and thought it was "absolutely fine" for Anand to leave. "It's clearly a frustrating loss and I will by no means criticize him for that. I think he behaved absolutely normally." Referring to his 2016 New York match, Carlsen added with a smile: "Besides, I am certainly not one to give lessons on leaving press conferences prematurely!" Giri kibitzing Carlsen vs Anand. | Photo: Shamkir Chess. While there, Anand pointed out improvements for his play (see the annotations below). He said that before the rook endgame, which was just lost, he made "far too many mistakes." Carlsen didn't expect to win this one: "Clearly I thought there wasn't too much in it. I sort of hoped to be slightly better from the opening but I couldn't find it." For anyone who was wondering whether Anand might have resigned prematurely, that was certainly not the case. Players at this level know the winning plan for White perfectly well, as Carlsen demonstrated at the press conference (see tweet above). Anand was definitely not happy with his play. | Photo: Shamkir Chess. "I like both, but if we're going to play the long one it's much better to play the one that we play here, without increment. In general in classical chess I believe it's a good idea not to have increment because it gives an extra dimension to the game, in which you have to spend your time well and actually ration it rather than just relying on the increment." Carlsen prefers the classical time control without increment. | Photo: Shamkir Chess. Sergey Karjakin managed to beat Anish Giri with the black pieces after having survived a dangerous position in the earlier middlegame. "It was April 1; a good result for me but not a good game," said Karjakin. "I think I got a terrible position out of the opening." The Russian noted that had "a huge amount of analysis" in the position after move nine, but somehow he hadn't considered the obvious 10.d4 there, "probably because the computer doesn't show it." Karjakin wasn't prepared for an obvious pawn push in the center. | Photo: Shamkir Chess. Karjakin felt he was busted after 17.Ra3, a similar rook maneuver as in the Zaitsev variation of the Ruy Lopez. "I wanted to start a new game but I tried my best to play on," said Karjakin, who not only played on but was tactically more alert than his opponent in the remainder of the game. He was indeed busted, but Giri decided not to go for the sacrifice 20.Bxh6!, which should be winning. "I should have considered this more seriously," he said. "I played very badly. I thought I am anyway slowly winning." Giri: "I played very badly." | Photo: Shamkir Chess. The longest game of the day ended in a win for Ding Liren, who beat Alexander Grischuk as White. The two followed the big game Aronian-Grischuk from the 2018 Candidates' Tournament, where Aronian missed a win in a sharp position. Today's game continued more quietly—so quiet that both players initially missed a tactic. One move later Grischuk allowed it again, and this time Ding spotted it and won a pawn on h5. 20.Bxh5! won a pawn here for White. 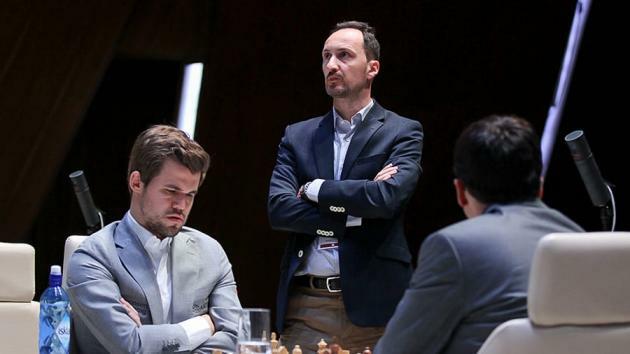 Grischuk felt he was lost after his opponent's positional exchange sacrifice. In time trouble he actually had chances to get back in the game but after move 40 White was in control again. Grischuk overlooked an early tactic. | Photo: Shamkir Chess. Veselin Topalov had some chances against David Navara, but couldn't keep the pressure. Perhaps he shouldn't have traded the last pair of rooks. Navara again got into terrible trouble and said he hopes to be able to play quicker in the remaining rounds. Topalov couldn't convert his advantage today even though Navara was in terrible time trouble. | Photo: Shamkir Chess. Once again, one of the five games had very little content. In this case it was fully expected though; compatriots Teimour Radjabov and Shakhriyar Mamedyarov have been very "friendly" with each other in mutual games for many years now. At the press conference Radjabov was asked about a Facebook post by Emil Sutovsky, who complained about the two quick draws in the first round. The Israeli grandmaster, who is now also the FIDE director general, said it was "a shame" to happen in a tournament that is a memorial for Vugar Gashimov, a very fighting chess player. Radjabov: "If there are thoughts and opinions from FIDE officials, I think it should be done in a more careful manner in general. You first of all have to think about the rules that exist. If the rules allow it, there is no problem with it." "If there are all draws like this, then it's really a problem. If there are just one or two games happening like this, I don't think it's a huge problem in general for chess, because usually most of the games are fighting and there are so many rounds in so many tournaments that it really doesn't change much," he said. Yet another draw in Radjabov vs Mamedyarov. | Photo: Shamkir Chess.